We have been building high quality steel boats since 1997. To date we have completed 157 boats from narrow-beam (6ft10in) up to 12ft6in wide-beams. 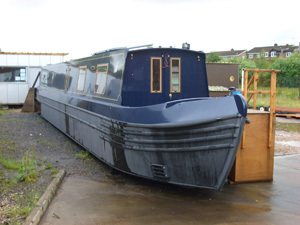 The range we build include "Measham" narrowboats (6ft10in) which have a trad, semi-trad, or cruiser stern and a 2m wide baseplate, 10ft widebeams which are usually cruiser stern and have a 3m wide base-plate, the luxury river cruiser hull which is 12ft beam with a double chine and a 3m baseplate. This luxury cruiser can be fitted with hydraulic wheel steering, electric or hydraulic bow and stern thrusters, and an electric or hydraulic anchor windlass. 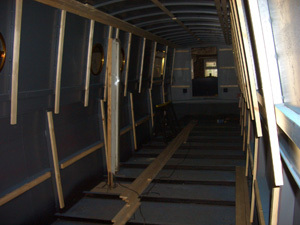 We also have designs available for various types of wide-beam Dutch Barge, and a coastal steel motor cruiser. These have been designed by Nick Branson of Branson Design and are specified and built to a very high standard. They are available as R.C.D. category C or B to handle estuary or coastal sea conditions. (The inland boats are built to category D). The steel used is grade S275JR and all welding is to British Standard / Lloyds 4782. We are also licensed to build passenger and restaurant boats to fully meet the requirements of the M.C.A. We offer boats from primed steelwork hulls, sail-away, lined sail-away to fully fitted out to a high standard. All boats are built to meet and exceed the Recreational Craft Directive, and are supplied CE marked with documentation to meet the Boat Safety Scheme requirements.